WJOF: Fight Like a Girl Curriculum- cool! 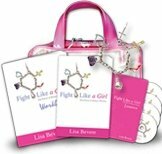 Fight Like a Girl Curriculum- cool! event, and that was the "Fight Like a Girl" curriculum! those who want to host a study in their home or church. to "fight like a girl" and find your true potential and fulfillment." so feel free to spread the word!